Gingerbread cookie dough in 15 minutes flat? oh yes you can! I timed it, and this even includes me taking pics! Christmas cookie baking is in full swing at our house. This is day four of some solid baking. I’m going to a Cookie Exchange Party tonight and needed something quick that would allow me enough time to go to yoga before the party. I’d promised to bring gingerbread cookie dough for us to bake and decorate, so I pulled out one of my favorite cookbooks-America’s Test Kitchen- and got to work. 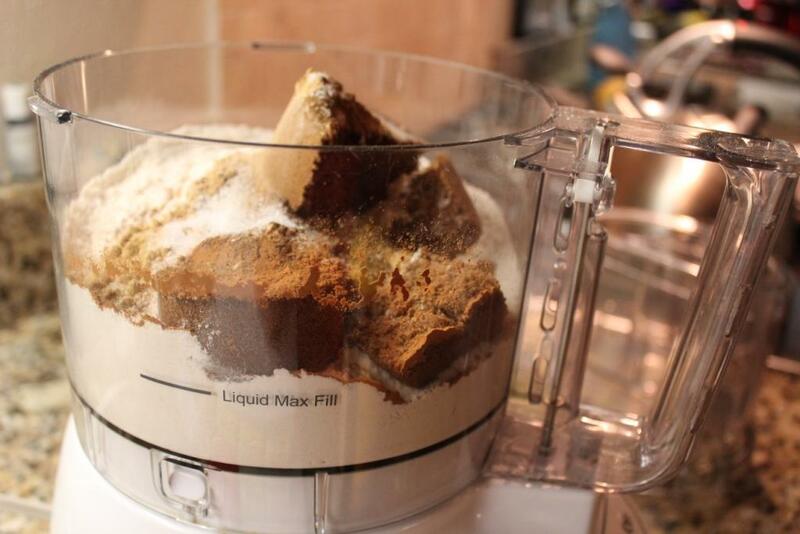 Gingerbread cookie dough in a food processor- oh yes! Make sure you’re using a food processor that can hold at least 7 cups. That’s how big mine is and it just worked. First start by adding your dry ingredients to the food processor bowl-flour, dark brown sugar, baking soda, cinnamon, ginger, cloves and salt. Process until combined. Next, add the butter. I warmed mine up in the microwave for 10 secs so it wasn’t as hard and cold as a rock and cut it into small pieces before adding it to the bowl. 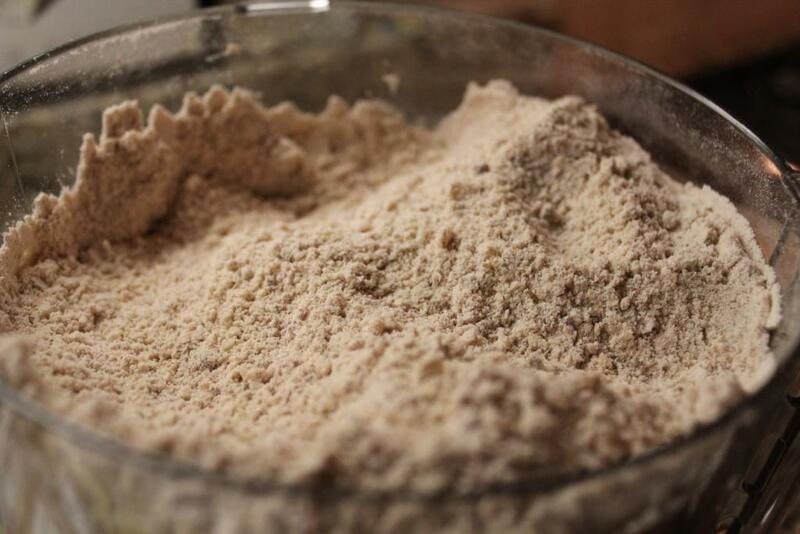 Process until dough resembles sand. Now you’re ready for the wet ingredients. In a wet measuring cup, mix together the molasses and milk, first pouring in the molasses, then adding the 2 tablespoons of milk. With the food processor running, slowly pour in the wet ingredients through the feed tube. Stop processing just as soon as the dough comes together into one mass. Divide dough in half, wrap in plastic, and refrigerate until firm, then roll out. Or roll out while the dough is still soft between 2 pieces of parchment, then refrigerate, and cut out shapes. See Gingerbread Cookie Tips for Hints and Tricks for rolling out this dough. Bake at 350 degrees for 8 to 11 minutes. Courtesy of America’s Test Kitchen Baking Cookbook. 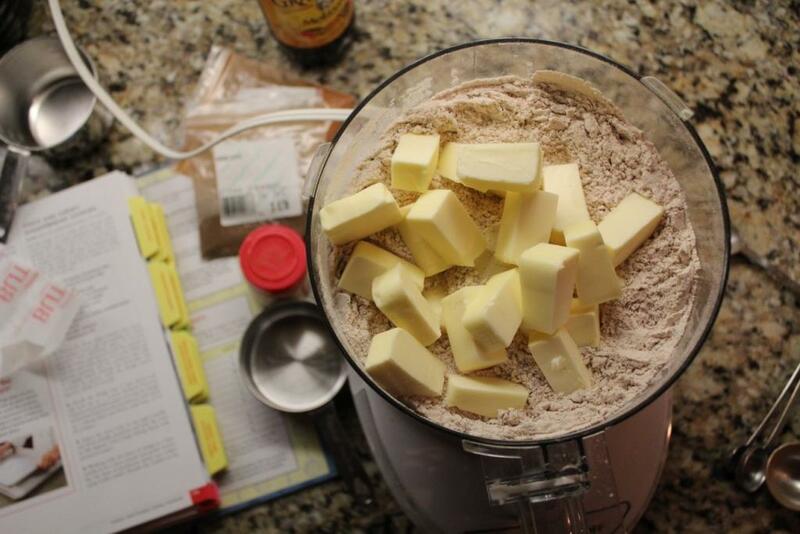 Process flour, baking soda, brown sugar, cinnamon, ginger, cloves, and salt in a food processor until combined. Add softened butter cut into small pieces. Process until mixture is fine and sandy. Mix together molasses and milk in a wet measuring cup. Slowly add to dry mixture through the feed tube with the food processor on. Process until dough comes together. Divide dough into two pieces. Wrap in plastic and refrigerate until firm. Or, if you plan to bake cookies immediately after making the dough, roll the dough between two pieces of parchment paper until 1/4 inch thick. Refrigerate about 15 minutes until firm. Remove top sheet of parchment paper and cut out shapes. Place on a baking sheet and bake at 350 degrees for 8 to 11 minutes. Oh Yeah, the food processor is the way to go. AND I love chewy gingerbread cookies and they are hard to find. Thanks for the recipe! What a great recipe! I love that it all goes into the food processor!! Great method using the food processor! I’ll have to pull mine out for cookies this year, the dough looks perfect! I’m pinning this one! The food processor makes it so easy! Definitely recommend this method. Then you would absolutely love these- I haven’t found a better gingerbread cookie recipe. yum!